1- Turn your lipstick it into a hydrating lipgloss with one light coat. Using vaseline as a base or a top coat to lipstick, or even just as a stand alone gloss helps my lips stay hydrated. I really love these mini Vaseline lip containers. For glossy looking eyeshadow you can also use Vaseline as a base before application. 2- Smooth Vaseline over eyebrows to tame and lock them in place. This is honestly the BEST eyebrow gel I’ve used! First, I add a little color to my light eyebrows. Then I take just a tiny bit and rub it over them. I shape them afterwards, and they stay put—for a long time. 3- Heal dry and cracked skin by covering an ample application of Vaseline with socks or cotton gloves (preferably leaving to heal overnight). I’m cursed with dry skin. Often in winter my finger tips and heals will crack. I’ve found that using gloves while washing dishes or being in cold, having longer fingernails (to prevent finger tip exposure)—sounds weird but trust me it works, and wearing socks does minimize the cracking but it doesn’t usually prevent it altogether. I’ve tried many different creams and remedies. Super glue helps only temporarily and really can cause the crack to worsen, other creams help but Vaseline truly does the best job. I put it on at night and sleep with cotton socks or gloves. Just be aware that it will seep through the cotton by the time you wake up so take the socks off before walking on tile or anywhere you don’t want footprints being left. 4- Highlight cheekbones using a very thin sweep of Vaseline. You can simply smooth a tiny bit of vaseline on your cheekbone for a subtle dewy look. 5- Use Vaseline on your nose during allergies or a cold to prevent pain and redness. I do this for my kids so they are not in so much pain. This also works to clean up kids’ ‘crusties.’ Smooth vaseline over and wait for a bit, then easily wipe the stuck snot away. Vaseline is my go-to during cold and allergies. I have to have it or my nose hurts so bad! My kids and I just got over a two week cold. We went through at least 6 boxes of Kleenex. Using Vaseline is the only thing that helped with the nose redness and pain. 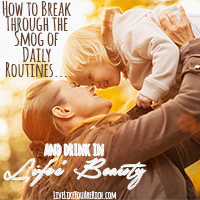 My kids felt so much better too and eventually recognized that getting their noses smeared with Petroleum Jelly was something to be desired. 6- Avoid the dreaded colored skin when dying eyebrows, hair, self tanning or painting your nails using Vaseline. I set Vaseline up as a barrier between where I want the color and where I don’t. This is especially effective for dying my eyebrows. I border where I want my eyebrow dye to go using Vaseline. Once I’m happy with the shape and size, I fill in the border with the dye. After my eyebrows are dyed I simply wipe it clean and I don’t have to deal with color where I don’t want it. Basically Petroleum jelly can be used as a barrier between where you want color to go and where you don’t want it to. 7- Use Vaseline to prevent bloody noses due to dry weather. Simply put some on a Q Tip and coat the inside of your nostrils daily and before sleep. My foster brother used to get bloody noses overnight until we began this protocol. It was so effective that if he’d forget for a few nights the bloody noses would come back. My son is prone to bloody noses and using Vaseline prevents them. 8- Never have a stuck nail polish bottle again. Just wipe vaseline around the rim before closing it. Now it will open easily when you need it next. 9- Make your perfume last longer by rubbing some vaseline on the wrist or throat and then spray it on. This is a great way to make expensive perfume or even less expensive body spray last much longer. Not only does Petroleum Jelly/Vaseline cost very little and last a long time, it is often the most effective product for the nine uses I mentioned above. 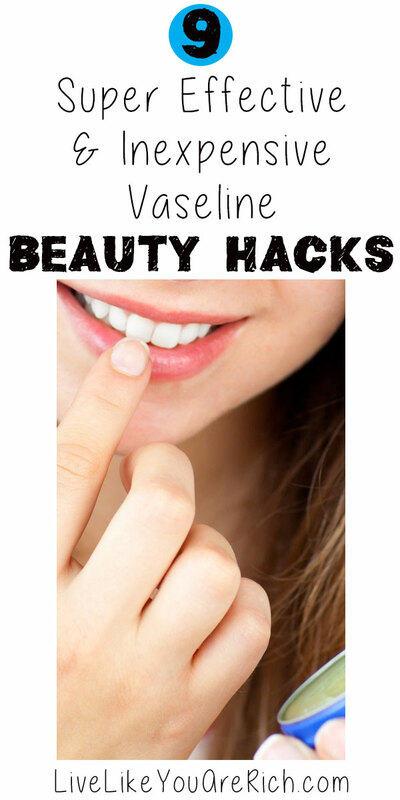 Do you use Vaseline for a different beauty hack? If so, please tell us below. For other ‘rich living’ tips and money saving tips, please subscribe, like me on Facebook, and follow me on Pinterest. I didn’t know almost all of these! When we first moved from Iowa to Idaho my son’s eczema was super bad and we just rubbed vaseline on him every night and every morning. Now it’s fine! That stuff is like gold! I’ll have to try the eyebrow tip! I have allergies and using it on my nose definitely helps prevent pain and redness. I asked my doctor about it and she said it is one of the standard self-help tips for surviving allergy season. I may try using it on my heels next summer. Thanks for the feedback. Yeah it is quite miraculous how well it works! Vaseline is one of my favorite products!! I always feel like the old man from My Big Fat Greek Wedding, like how he talks about windex fixing everything, for me… it’s vaseline! Thanks for sharing at Thursday Favorite Things Blog Hop! hahaha! That’s so funny. Quick FYI- There is a My Big Fat Greek Wedding Part 2 coming out! My heels crack terribly in the winter too…I’m trying this! I know of a dermatologist who recommends using Vaseline as a moisturizer or night cream for your face and body. Cool! Good to know. I love the stuff Haha! Such really awesome hacks, especially using the old infamous vasiline to make your perfume last longer. Thanks for sharing. You’re welcome. I love them too. Thanks for the comment and for stopping by.